This piece uses the Total Theatre Magazine Print Archive to analyse how the participatory component of performance became more and more prevalent from the mid-1990s, reaching an apex in 2011 at what Dorothy Max Prior called the ‘tipping point’ for participation in her article ‘A Game of You – and You and You and You’. Back in 1995, in an article entitled ‘Multimedia – The New Puppetry?’ Tim Eagle had described this type of practice as ‘rarely seen’. There are a few strands to my interest here. As video games have become more entrenched in mainstream culture, so too has participation as a means of embedding audiences within work. Are there connections between the two forms? Early experiments in chance performance emerged around the same time as the first personal computers, and the instructional nature of performances such as Happenings are akin to lines of code in analogue form, like the Fluxus ‘Event Score’ with its ‘instructions… that consist of simple everyday actions, ideas, and objects that were recontextualised as performance’ (as described by Philip Watkinson in ‘More Chance Occurences’ which appeared as a boxed-out supplement to his main article, ‘Take a Chance’, in issue 23-4). Both Happenings and computer code are suggestions ready to be activated by a user or player, so it wouldn’t be the only parallel between art and technology. The purpose of this piece, therefore, is to highlight and unpack those similarities by comparing gaming with forms of performance that have a participatory component, specifically live art and theatre but also more contemporary practices that invoke gaming through their methodology and execution. To look at the process in action in my own work: in 2007 I created the sculpture Wine Games, literally spending the afternoon on my hands and knees live-sculpting with 300 Wine Gums, the popular confectionery, because… why not? To make this, I followed a simple algorithm (sequential actions leading to an output) to tell me where to put the sweets, with reference to Allan Kaprow’s notion of the Happening. Much later, after many years of experimentation, Wine Games evolved to become the Cultural-Catalyst Computer (CCC), the hardware that gives rise to the software that is my art practice. In other words, a means of creating work. In its totality, the CCC is everything I have at my disposal to generate the Gesamtkunstwerk that is Wine World: a world within our own world; a representation of the databanks of the Cultural-Catalyst Computer that uses the ratio and structure of the original Wine Games system. My performances, sculptures and visuals are merely the ongoing contributions that flesh out and build up this new place. To avoid sensory overload and thus inaction, the limit of 300, which is still a lot, helps in bringing me down to earth (all right, a little closer anyway!) and narrowing my focus, allowing invention to triumph over distraction. Speaking of Happenings, Philip Watkinson (2011) described them in the aforementioned article ‘More Chance Occurrences’ as ‘loosely structured theatrical events that began in New York in the 1950s [that] often consisted of the participants (both performers and members of the audience) following instructions, sometimes across quite a large area such as a city… significantly blurring the line between art and life, between performer and audience’. With Wine Games, the sweets are effectively metaphors for new media objects, particularly video games, that are used as bits of information, specifically colours (yellow, red, green, orange and black) to produce an unpredictable form. A single packet of Wine Gums contains 12 individual sweets. Wine Games uses 25 packets and 300 sweets in total. The CCC contains 52 yellow elements, 101 red, 43 green, 45 orange and 59 black. These five broad sections contain fundamentals such as the initial colours, different media formats, references to time and place as well as additional material matter like paper types and other confectionery items. Recently my piece FLIGHT CLUB, for instance, used these colours in the form of paper planes. This approach is similar to a Fluxus event score as they recontextualise actions, ideas, and objects as performance. As well as directly referring to computer mechanics, my own practice links to the theories of performance artists. My statement – a cubed grid of 27 words, organised via three 9x9 square grids of related terms and concepts – references performance artists such as Acconci, Burden and Kaprow, who I see as the historical antecedents of my current practice. Back in 1995, in ‘Multimedia – The New Puppetry?’, Tim Eagle explained that ‘probably the clearest relation between the media [multimedia and the new media of CD-ROM, CD-I and Virtual Reality] is seen in the use of a visual language through which to communicate, play, learn and interact. The virtual world aims to represent a reality that we can understand, feel part of, and uses the same techniques as the visual storyteller of any medium.’ In my own work I let the audience dictate, to some extent, the content, using influences gleaned from the procedures and processes of video game play to enact a suggestive, facilitated framework for collaboration. 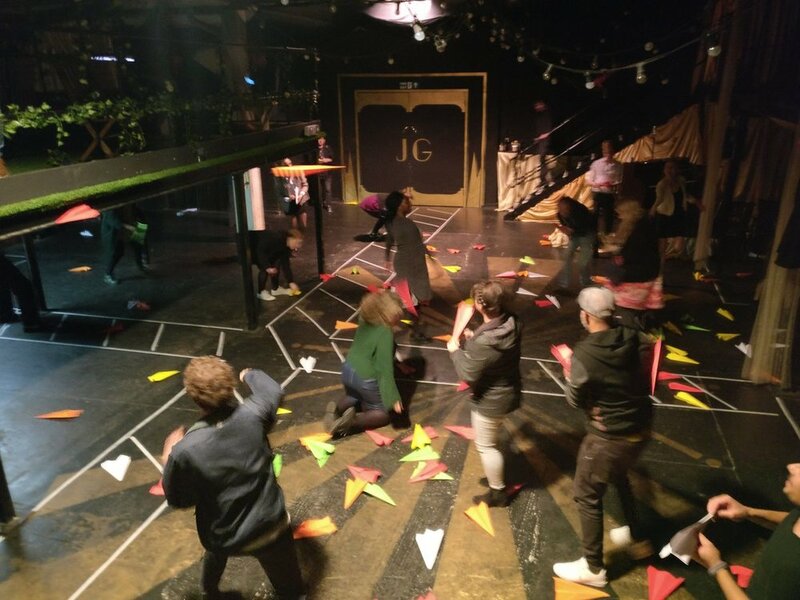 In FLIGHT CLUB, participants are free to choose how they use the planes, where to throw them, which direction to run in, whether they remain planes or are scrunched up into balls, what constitutes a hit and the conditions for victory. It’s collaborative, like it or not! Eagle goes on to exclaim: ‘Just look at the growth industry of computer game heroes where you are given the opportunity to become these characters and transform from passive viewer to hero and animator. This is an opportunity very rarely offered in theatre.’ In contrast, by 2011 (as noted by Dorothy Max Prior in ‘A Game of You – and You and You and You’) it’s ‘almost more unusual these days to sit down to see a show in which audience and actors stay firmly separated out on each side of the footlights’ as illustrated by Ontroerend Goed’s A Smile Off Your Face ‘in which participants are blindfolded and whisked through a series of sensory encounters in a wheelchair’. Sally Cook’s Activate Theatre and Julia Barclay’s Apocryphal Theatre neatly bookend the period I’m considering. Exploring community and co-creation in his 1996 article about making the show Mixed Reactions with Cook, dramaturg John Keefe described her form as ‘Creative performance experience… as well as experiencing theatre as a spectator, the audience member can also experience theatre as an active participant in the creation of the performance.’ For instance, in Mixed Reactions, the reins are shared between an audience who also become actors, actors who also facilitate, and a show that is also a kind of workshop, with learning and making happening in unison. It can be a risky undertaking to hand over a work’s autonomy to an unpredictable audience, but that’s also part of its allure. The more control is handed over, the more research and information is needed up the sleeve of the artist, so to speak, since structure is all that separates collaboration from chaos. This is exactly why I use the CCC as the framework underpinning my practice, all 300 components ready for their moment in the spotlight. I may not know how a performance will turn out, but I also know that knowledge of my own methodology will serve me well when it comes to improvising and adapting to unexpected scenarios. This aspect of my experience puts the gaming side of the coin at the forefront in the way that responses and reactions are limited, like in a video game, by the data running in the background. The fourth wall can never really be broken here because that wall would then become a part of the illusion. If, for theatre, the whole world’s a stage, then in gaming, the stage contains a whole world. Julia Lee Barclay, the artistic director of Apocryphal Theatre, created ‘process-based, challenging, unpredictable, experimental work… [to] push all of our limits to the edge, including those of our brave audiences’ In The Jesus Guy (2006) ‘five performers create a new show each night, improvising with written and improvised text, scores, ideas and visual materials’. An event that is different each time, adapting to the context and contents of any given moment? Does this remind you of anything? In a video game, game, or participatory theatre experiment, YOU are the centre of the emergent, unfolding narrative. There is a freedom inherent here, ‘a sense of liberation at not having to watch for meaning, as one might in narrative theatre’ – as documented in the Total Theatre Magazine article ‘The Jesus Guy’ (autumn 2006) by one of the co-creators/co-performers, Theron Schmidt. As the approximate median point of this survey, it is clear that momentum is building among audiences towards a more self-authored experience. With user-generated content in video games also reemerging around this time (see 2008’s LittleBigPlanet on PlayStation 3, a popular example of this approach), it seems pertinent to suggest that rather than developing in their respective bubbles, theatre and games may be actively stimulating one another to generate new forms of activity. In 2011, Philip Watkinson, drama practitioner-researcher and performing arts teacher, wrote about a process that allows him to incorporate the unexpected, or chance, into his methodology via the ancient Chinese book of divination, the I-Ching. (‘Take a Chance’, issue 23-4). Chance is an integral element of all gameplay, whether digital or real-life, because it involves active agency on the part of the audience/player. In other words, choice – the level of freedom open within the confines of the designed world – automatically empowers a more personalised take on the prescribed interactive elements, turning audience into participant and viewer into player. Inside a digital game, chance isn’t really chance, merely programmed semi-randomness adjusted in such a way that an impression of artificial autonomy can be read by the player as genuine sentience. In a game the dramatic tension is due to the limited possibilities when compared to the imagination of the player, rather than the acting chops of a scripted character within a scene. In a Mario game you can jump but you can’t pull out a gun or comb your hair. Games are underpinned by rules – in performance such rules may be less fixed. Perhaps the most explicit curatorial connection between gaming and theatre made by theatre producers in recent years has been made by the Beta Public series ‘that compares and contrasts video games that are in some way theatrical in their execution with theatre that uses games as either a narrative crux or structural impetus’. (See my Total Theatre Magazine review of Thomas Martin & Pat Ashe: Beta Public IX) Sophie London, when she reviewed the inaugural Beta Public show, questioned the role of player investment in what they were going for, suggesting that this was overlooked in favour of an artistic ideal. When I attended the event five years on, I found audiences had been integrated more successfully. It is clear from the outset that the games shared in the programme are open to all, whereas within the game-like theatre the suggestion is stronger than it was, but less consistent. Whilst never forced, the expectation is that someone will volunteer in order for the work to be completed. The two potential problems that can emerge from such scenarios are that either no one will come forward or that too many are willing, leaving some disappointed. One piece shown at Beta Public IX was Trip Hazards Theatre’s scene from Progress. This show uses the vintage (1998) party-game Dance Dance Revolution (or DDR) – initially a hit in the arcades and later released for the home market – as a narrative anchor. The choice of DDR is a fitting one, since the game practically demands to be played socially. It is a game where players have to step in time with the music blaring from the machine’s speakers, pressing down on one of four arrows on the floor in front of the screen, copying on-screen directions. The two actors, role-playing as a young couple, show typical long-term-relationship chemistry with their witty, sometimes snide back-and-forth, foreshadowing the disintegration that occurs in parallel to the game’s ebbs and flows. One partner plays whilst the other watches, admonishes and otherwise undermines the attempt to beat the game before an eager volunteer is selected to show everyone how it’s done. Welcomed onto the stage and into their world and, in the words of Nikhil Vyas (co-artistic director) ‘becoming a prop in the dissolving relationship between the two people’, this somewhat illusion-breaking introduction of participation feels like an unnecessary concession to the audience, considering player investment is already implied through the format of the projected game-screen shown on stage. Since the actor has his back to us during play we view him as we would our character in a third-person video game. The short excerpt does, however, continually set up our expectations before subverting the pay-off by delaying the playing of the perfect game, a great mirroring of the incremental improvement a gamer experiences on their journey towards mastery. Participation in FLIGHT CLUB, as with all participatory acts, aims to collapse the differences between performer and audience, process and product. It is at this point that Wine World as a whole and FLIGHT CLUB in particular show their potential as a tool for visual performance. The latter uses participation as a means toward generating empowerment, authorship and community. That is, players are activated, collectively, to take responsibility for the group and its activities. It brings to an existing space a new set of rules that can be adapted to fit the circumstances and potentially seem out of place, like an illusion or paranormal experience. In gaming theatre, participation is the only random variable not otherwise pre-programmed. It is unwise to include participation if you are not willing to cede to this basic premise: only ask for audiences to get involved if you are willing to accept and adapt to any and all consequences. Games, it is clear, specifically their tropes and conventions, are key influences on my participatory practice. Some of the best video games eschew verbal or written instruction, instead building their worlds in such a way that the required behaviour can instead be inferred through experimentation and play. Not a bad way to make collaborative live art too, especially for creators who like to incorporate chance within the internal logic of their ‘wine’ worlds.